Today’s post is part two of my Look Back At 2011. Part One – Pro Golf, covered the first six months of 2011, ending with Rory McIlory’s fantastic win at the U.S. OPEN. Today we start from July 2011, pass through the Tiger Woods hot dog incident and finish out the year. In July the Nationwide Tour was in my back yard at the Utah Championship. I watched soon to be NWT player of the year J.J. Killeen win in a tight battle with Jeff Gove. I also followed around a few future PGA Tour stars like Bud Cauley. In July it became official that Steve Williams was no longer Tiger Woods’s caddie. In a puzzling move, the LPGA added a “5th” major. What’s next? The 2011 (British) Open Championship was an all time historic tournament. Darren Clarke was possessed. He was SO consistent and calm. He finally got that major win, the Open. The one he wanted most. Congrats to Darren. Dustin Johnson won the first round of the FedEx Cup playoffs with a -19 score at the Barclays. Donald Ross courses are just too easy anymore. Too short. The tournament was too short too, cut short by hurricane Irene. J.B. Holmes underwent successful brain surgery. Glad he’s okay. The FedEx Cup came to a conclusion with Bill Haas hitting the $11,400,000 golf shot out of the water. Amazing. Hey Bill, can I have a loan? Tiger Woods found a new caddie, Joe LaCava. Utah local Jay Don Blake ends a 20 year drought and wins Champions Tour event. David Feherty’s show on Golf Channel is great. 25 skilled golfers graduate from the Nationwide Tour to the PGA Tour for 2012. Luke Donald to be referred to as “THE” Donald. Big news for Tiger, he made the cut at the Frys but had to endure a crazed “wiener lobbing” (above) fan who was screaming his name… Wow. Dustin Johnson has knee surgery. Chinese tycoons engage in golf purse wars. Lee Westwood announces that he’ll join the PGA Tour in 2012. The USA team beats an undermanned Australian (I mean, “International”) team in the Presidents Cup. LPGA star Yani Tseng invited to play in PGA Tour event, except she wasn’t directly invited and then later declined. Doh. Luke Donald wins every award possible, except rookie of the year since... well... he's not a rookie. 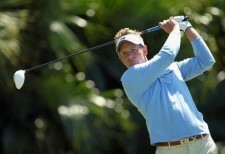 Luke Donald adds European Tour golfer of the year award to his 27 other 2011 awards. In historic fashion, Luke Donald wins money titles on PGA and European Tours. The most intense and grueling tournament in the world sends graduating class to the 2012 PGA Tour. Q School. I think Luke Donald’s effort to win the money list on both the US and European tours was amazing. This record may stay there for quite some time.